When I’m mixing up new facial products I like to use organic peppermint essential oil. Sometimes I use it alone and sometimes I will combine it with organic Lavender essential oil. Mixed with jojoba oil or grape seed is a great way to get a mini facial moisturizing nighttime experience. Of course these oils can be mixed with creams as well but be sure to know what you are allergic to before trying this out. I like the tingle of the peppermint but I also have to remind myself if I use this anywhere near my eyes I’m going to need to close them for a minute or more depending on how much I used. Peppermint essential oil is also good at relieving headaches—at least it has worked for me sometimes when I have a migraine. By way of beauty products I like to make my own when I can but I also have some drugstore products that I can get into as well. Next on my beauty DIY list of things I want to do is make makeup removing cloths. I saw a method for doing this so it’s really about making sure I have everything I need to get it done before I get started. Do you have any natural products that you like to use? I have been trying to figure out how to take care of my mom and realizing I could never be a nurse or a doctor. Seriously, just reading how to dress a burn wound and watching the videos (thanks YouTubers) have me squeezing my eyes shut. I’m not sure how mothers do this. It’s like every wound of their child they are there to clean up and take care of no matter how bad it is; seriously, I think I’m going to be sick and I think her blisters are just starting to get ready to seep. They are much bigger than the last picture so I hope it heals okay. That being said, today I wanted to talk on fashion and something I have run into a lot lately. I have seen a lot of chatter lately about dating, marriage and drawing a man in. The focus is always on dresses, hair and makeup but rarely, if ever, on focusing on inner self. I am a proponent of being the healthiest you that you can be mentally, emotionally and physically. That being said I also know humans are visual creatures. When we are faced with the unknown we judge first with our eyes. We might try to determine if it’s safe or even attractive. So many things get processed at first sight and we judge. Some people judge for the worst based on preconceived notions but that’s an entirely different blog there. I do understand the idea that paying attention to your outer beauty is important, though I will not say it is the most important thing. But still, let’s face it, beauty draws the other person in. Is that shallow? Yes. But it is still factual. We could say men are shallow idiots but let’s be honest; how many women don’t look for the same zing of physical attraction when met with the unknown? If you saw a man who wore his pants nearly down to his knees, his hair looked like it hadn’t been combed in a few months and his nails looked like they hadn’t been cleaned in decades would you want to go out with him at first sight? Some people may say yes, some may say no, but that is life. Beauty and attraction are different things to different people. It kind of reminds me how some men want the perfect ten in a woman when they aren’t even close to a perfect ten themselves. Yet they will get upset if a woman doesn’t reciprocate their attraction. They’ll insist she’s just looking for a GQ model and a man with money. Physical attraction is important. When faced with someone unknown physical attraction will be what draws the person in; a lack of attraction may send them the other way. Shallow as that may seem it is still a reality. While I will not advocate wearing dresses every day if it is not your style I will advocate putting the best you that you can forward at all times. You only get one first impression so make it a good one. Next Thursday I will talk about C&C and how it can change a first impression. Sometimes eating healthy can be as simple as a substitution. When I’m not cooking mostly vegetarian I am cutting out as much of the not so healthy foods that I can. 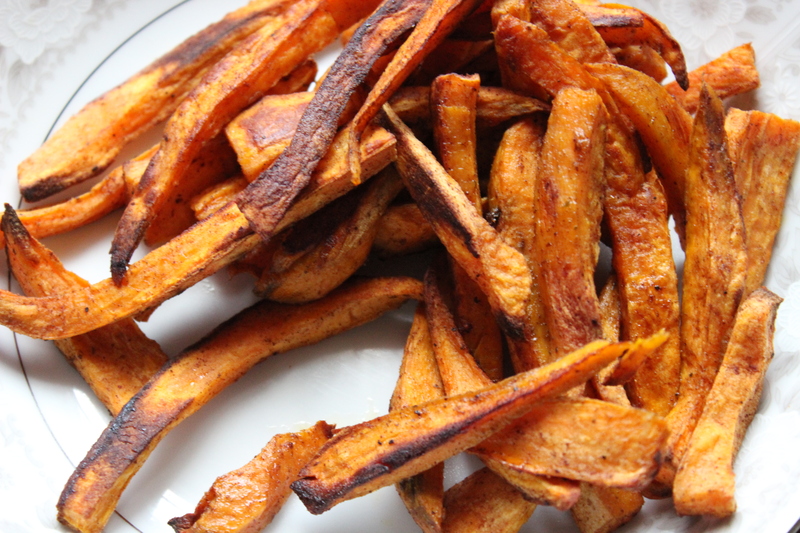 Enter baked sweet potato fries. I like to season them with different seasonings and spices but sometimes I make them sweet by using cinnamon and sometimes I will add ground ginger. If you’re in the mood to cut out the basic white potato and deep fried fries then baked sweet potato fries might just be for you. I use about 1T extra light virgin olive oil that I pour into the bowl over the potatoes and mix it in with the seasonings I have already sprinkled on the potatoes. You can use your hands or a wooden spoon (any spoon really). Then I dump them into the dish I am going to use, or I will lay them out on the cookie sheet depending on what’s available to me at the time. I bake them (400 degrees F) about 45 minutes to an hour being sure to shake them / turn them about half way through. Different ovens cook differently so if you decide to make them be sure to check up on them so they don’t burn. Crunchiness and softness will depend on how thick you cut your fries. I will state it up front that I am not an avid makeup wearer. I got into makeup many moons ago when I modeled and got out of it swiftly. It just was never really for me, but that didn’t mean that I didn’t wear it on special occasions. According to my mother I took the lipstick out her purse when I was a little girl and made a mess on my face. So I can’t say that I did not like makeup at all, it’s just as I grew I guess I didn’t care that much about it. Last year I got into experimenting with some things. Mostly I did this because I finally opened my makeup case and realized all the stuff I needed to throw away since I hadn’t used it in years. And of course going into the store and seeing a shadow on sale was like a flashing sign telling me to buy it. I have been wearing makeup a little more lately, not every day, not even every week, but sometimes I play with the shadows I have. Part of it is just for fun, the other part is I look at all the shadows I just “had” to buy and think of how many shadows I just “had” to throw away because they sat in a case for years, used once and then never used again. Everything has a shelf life and my eyes are important to me so I opted for not using possibly severely damaged products. On this blog I will talk about beauty, health and fashion because I love health topics like fitness and food; I like designing my own outfits and sometimes shopping too, and of course I’m wearing makeup more frequently but also doing more natural DIY face and body products. Topics may be about reviews of new products, healthy recipes I have made and foods I like to eat, dresses I’m working on or have recently finished, fashion in general and sometimes even a look at how all these things impact life and how people treat people based on these things. You can get a lighthearted glimpse of that in a post I did on my other blog. I hope you all will come back and share your experience here, tell me what you think, and please follow the blog for new posts weekly.